A lot of people think that comic book inking is simply tracing. First of all, if you ever try to trace someone else’s pencil drawing in ink, you’ll see immediately that it’s not as easy as it looks, and takes artistic talent to do. Second, inkers usually add a lot to the drawing, and sometimes inking is known as “finishing” because that’s what the inker is really doing: finishing an unfinished drawing. Take a look at this example. 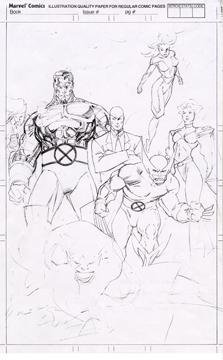 The first is a pencil drawing by Jim Lee. The second is the finished piece after it was inked by Scott Williams. Wow! I wish I could do that! I have so much respect for any artist who can work in inks…I know that it takes a lot of work and a steady hand…and always lots and lots of talent and imagination. The inker has to be an extension of what the artist originally had in mind…even taking it a step higher. The above example shows a lot of power after the inking has been done. Beautiful! What materials do you use to ink? Since working with Sequential Tart I’ve been exploring the processes for print and web comics. Your inking is very nice work. Thanks! I use India ink with a variety of tools: sable-hair brushes, crowquill pens, and mechanical pens. I always try to use the standard comic book bristol board as a surface, even if that means making a copy in non-photo blue at a printshop. Neat. I have some of those supplies too, though I use synthetic brushes. While I’m learning about comics, I’m one of those folks that can’t understand something without trying it myself so I’m dabbling in some art stuff like watercolor, calligraphy, sketching, pen & ink, and (soon) a wacom tablet. I have a little aptitude for art but have no technical skill. Do you ink comics on a regular basis or is it just a time-to-time thing? If you’ve got any projects coming up maybe I can do an interview with you for Sequential Tart or I can write a review on a comic you’ve worked on. I haven’t been inking much lately. The last thing I did professionally was a pin-up for AK Comics about a year and a half ago. I did pencil and ink a drawing of the main character from my chapter in the Artifact project I’m working on (see the Artifact blog on my blog roll for details). In the example oof the 2 photos, Jim Lee’s drawing and then a finished piece, if you knew anything about Jim Lees style and process, you would know he does a loose sketch and THEN pencils over it in darker pencil, which is THEN inked. You happen to have it early and in the end – missing the inbetween. Check out Jim Lee on YOUTUBE, he has a slot of drawings, done live and a bunch in under 5 minutes (including inking). The example you show is misleading and false – there would be far more pencil laid down before it was passed to an inker. Scott Williams is my fave inker, dont get me wrong, and im NOT saying that inking is tracing at all, just saying that (most) pencilers draw far more than youve implied. Jim Lee is amazing and draws in such a recognizable stlye, also looks even better with Scott Willaims ink. Thanks for the comment and the info. I’m not saying I don’t believe you, but have you actually seen the in-between version of these two drawings (and, if so, can you point it out to me)? 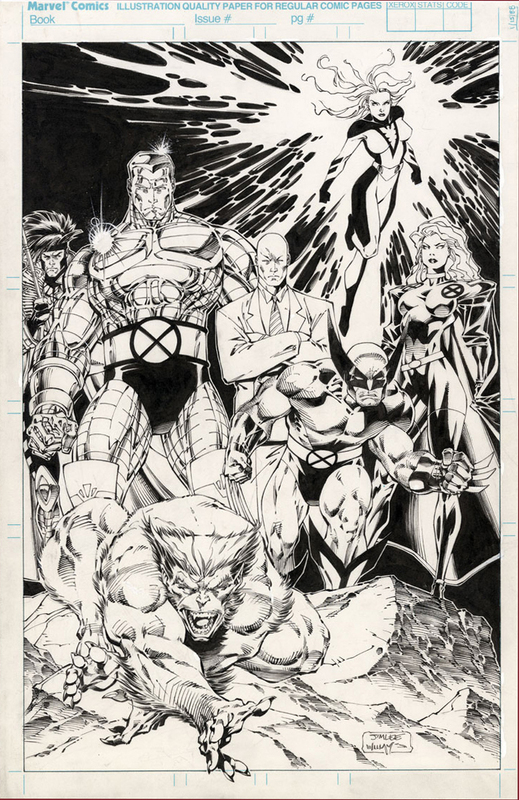 I’ve read more than one interview with Jim Lee where he said that he and Scott Williams have worked together for so long, and Scott is such a good artist in his own right, that he doesn’t have to draw as detailed as he would if any other inker were inking him. And I DO know a lot about Jim Lee’s process. I’ve been following him since he got his start, I watched the old videos that Stan Lee hosted back in the early ’90s (both his solo one, and the one with the other image guys), I read the chapter about him in a book about comic artists, and I’ve read lots of interviews in Wizard and other magazines. At the very least, this would be an extreme example of what inkers do, even if there was an in-between stage. I think calling it “misleading and false” is somewhat of an overstatement. I really like your inkings and think they are really effectives ! Yes, I do draw my own stuff, but I’ve only worked professionally as an inker. I think there’s a big advantage to having your own drawing ability, and I’m not sure if someone with absolutely no drawing talent could be an effective inker. I used to have some drawings online, but both of the sites that hosted them no longer exist. When I get a chance to repost them somewhere else (maybe here), I’ll reply here again.